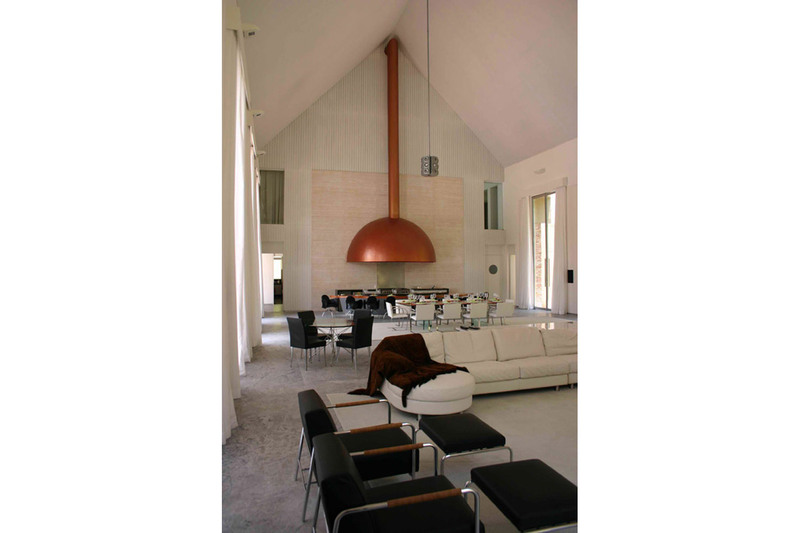 Bernardo Paz, a businessman who is well known worldwide for his astonishing collection of modern art, has just finished his new country house together with his 5 private museums. A 2200 sq. ft. living room was chosen to install his private home theater. The house is divided into four distinct areas – bedrooms / spa, sauna and breakfast room / living room and gourmet’s lounge / and the pool area. 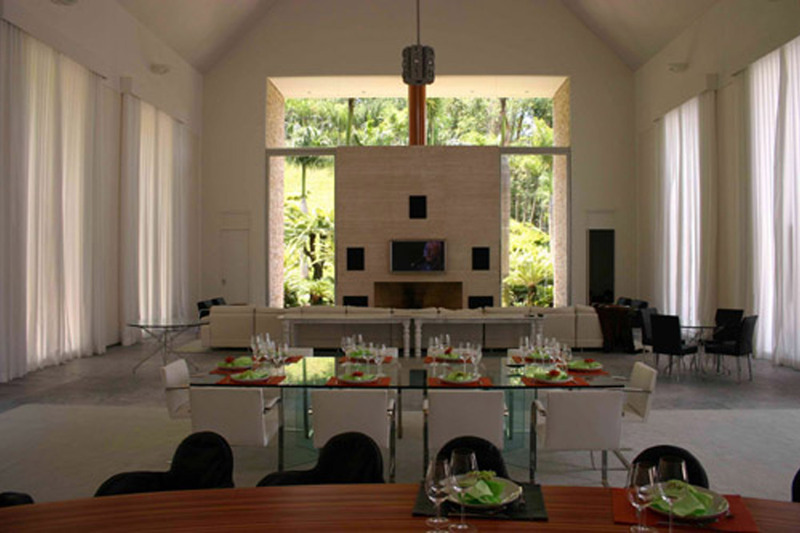 The main room contains a large couch that can accommodate 12 seats, a dining table and a kitchen area. Paz required an A/V system that would serve not only as a home theater but also provide background entertainment for his frequent parties. Another project requirement was that his magical garden, that includes no less than 3,000 palm trees and exotic plants, should be seen from any point inside the room. The large room is perfectly symmetric with four large 15′ high glass doors located on each side wall to allow viewing of the gardens. The space between each glass door allowed all four surround speakers to be installed. A 61″ plasma screen installed at the front marble wall, on top of the fireplace, also provides the primary video display for the theater, along with a 7.1 audio surround system. This room is used as a relaxation area, where Bernardo and his wife enjoy an early breakfast observing the green and a few pieces of his art collection placed around the pool. The space has been designed using wood. 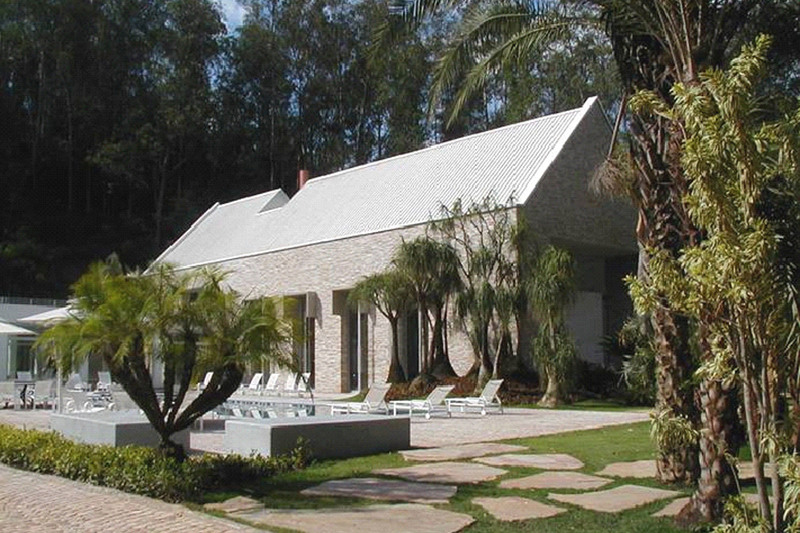 WSDG Brazil worked with architect Paulo Orsini, who designed the entire residence and the various museums that Paz has built around his house. Surface treatments have been selected using materials that are conducive to the spirit of the room but specifically placed to solve the acoustic anomalies of the raw space. The high (38 feet) ceiling and parallel side walls of glass and stone created some very interesting acoustic challenges. Obtaining sufficient space – basically by demolishing part of the side walls – for mid-high frequency absorption / reflection control. 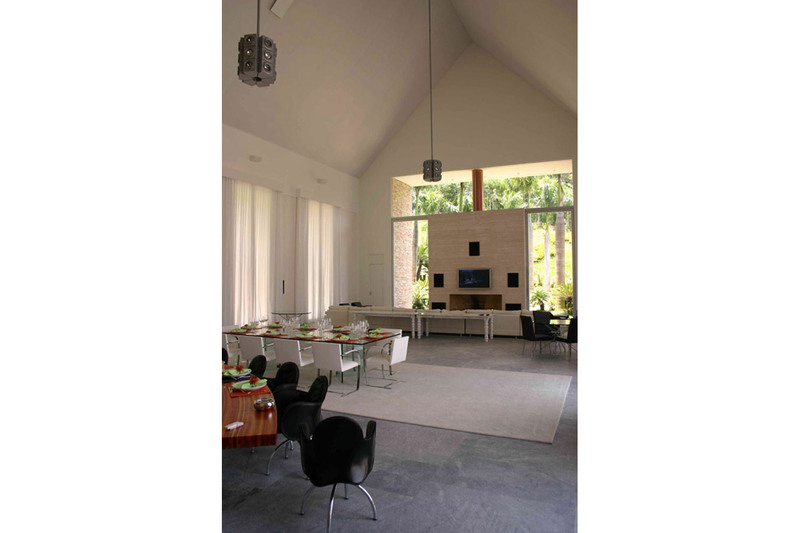 The entire ceiling was covered with acoustically transparent white fabric that hides a broadband absorption system. Most the back wall area was covered with a white wood diffusor/resonator treatment that is responsible for the well-balanced low frequency response existing inside the space. This surface absorbs low frequency energy from the space and diffuses mid and high frequency sounds. Front speakers positioning – the existence of a fire place and a 61″ screen caused the center channel to be located above the screen and angled towards the premium seat – preserving excellent high frequency distribution. 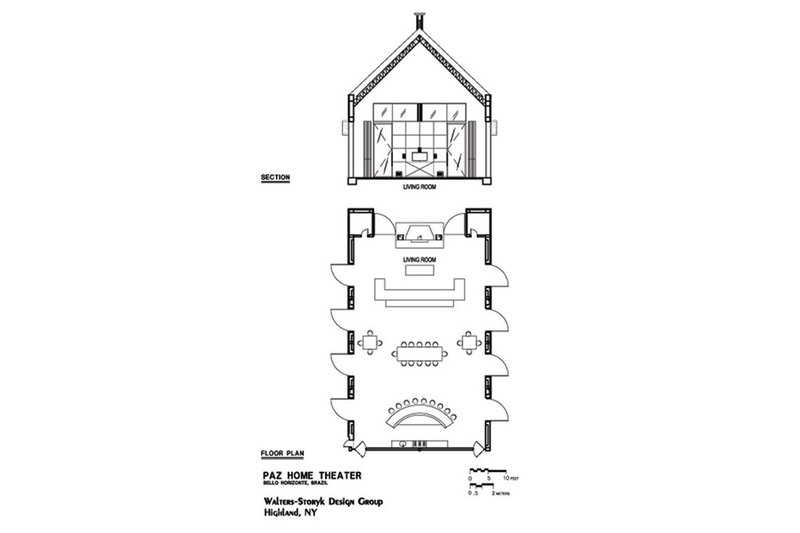 5.1 configuration as well as sound pressure distribution and coverage around the room. Seven Genelec 1032 and two Revel B15 subwoofers can be used at the same time in a stereo configuration. Low frequency control in room accomplished with Helmholtz resonators installed in the back wall as well as with the air space left behind the ceiling treatments. The RT60 before the treatments was over 3,5 seconds and after the installation of the acoustic treatments it was reduced to a 0.7sec. that is more than appropriate for a 60,000 cubic feet room. Playback flexibility was achieved by wiring the entire house and adjacent external areas to the state of art Lexicon MC12 receiver that manages the whole system.